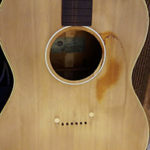 It’s been a while, but I finally got around to finishing the next chapter of the Epiphone Cortez repair blog. Find it here: Epiphone Cortez Repair Blog #3: Scrapers, glues and bagging. Includes a recipe and a photo of a sponge. Hello, and welcome to the third blog in our series showing how we repaired this 1960s Epiphone FT-45 Cortez. In part two, we defretted the guitar and removed the bridge and pickguard. This time, we’ll remove the finish, and discuss hide glue and guitar humidity. We’re going to refinish the the face of the headstock and the top/soundboard. So, the first step is to remove the old finish.